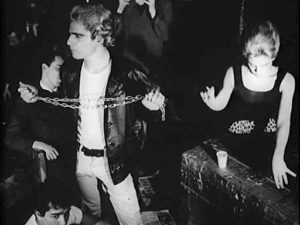 The end of episode seven of Twin Peaks: The Return, cheekily entitled (by my Dish Network DVR), “There’s a Body All Right,” is caught between two experimental film traditions of the 1960s: that of Pop artist, Andy Warhol, and the structural cinema of Michael Snow. 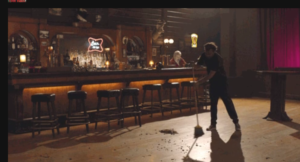 In my favorite shot of the entire series thus far, a worker at the Roadhouse bar sweeps up the floor. The camera is static, in long shot such that we see a huge swath of the floor, with the bar in the background, at a 45 degree angle to the camera axis. The shot at first seems completely banal. 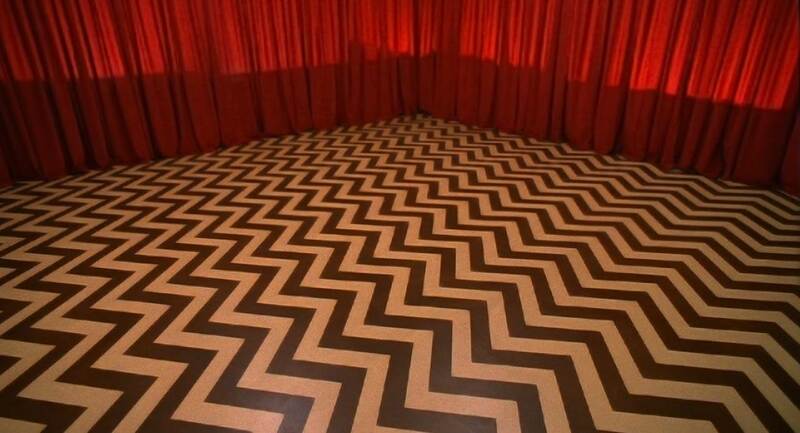 And yet, as it continues for well over two minutes, the floor of the Roadhouse becomes more interesting, aesthetically, narratively and ideologically. The shot tests the patience of viewers, yet it also engages their obsessive/compulsive desires: Will we get to see the worker finish cleaning the entire floor? In its static simplicity, Lynch captures what television almost never attempts, the celebration of the pure banality of everyday life. It is simply a fact that the worker must sweep the entire floor; the excruciating length of the shot forces us to realize that to keep viewership, television incessantly cuts around such uninteresting behavior. This convention radically distorts our experience of the world, demanding that our lives be more interesting than they can possibly be. The static camera and the studied composition is most reminiscent of the 1960s films of Andy Warhol. Shot at a similar looking warehouse in Greenwich Village, “The Factory,” Warhol’s films consist of long takes in long shot, away from the actors so that we can see their relationship to one another. In Vinyl (1965), an adaptation of Anthony Burgess’ experimental novel, A Clockwork Orange (1962), the incompetent actors–Gerard Malanga, Edie Sedwick, and Ondine—sit at the Factory mumbling their lines while standing around the sparse set. Lynch replicates the Warhol set-up with fascinating results. Two minutes and ten seconds into the long take, the phone rings. Lynch cuts into a close-up on the face of Jacques Renault. As was the case twenty-five years ago, he is peddling prostitutes. When the unknown caller on the other end of the phone call apparently complains that the girls were only fifteen years old, Renault indignantly states that the Roadhouse has been owned by the Renault family for 57 years, and he will not allow two whores to threaten the business. The incorrect temporality of the long take of the sweeping man calls attention to the fact that something is horribly wrong with the narration. We saw Leland Palmer suffocate Jacques Renault twenty-five years ago. The fact that the Renaults have been pimps for half a century, spanning the present, the time of Laura Palmer, and even earlier, might indicate some form of a time loop. 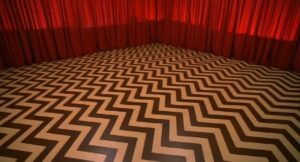 After a cut back to the worker finishing sweeping, the episode resumes its narrative course: we watch a corrupt warden allow the evil Dale Cooper to escape from prison. However, the episode’s last shot returns us again to the world of experimental cinema. At the Double R Diner, the waitresses feed a hungry crowd. A man rushes in screaming if anyone knows the whereabouts of Billy. When no one responds, he rushes down the street, presumably to find help. No one in the diner reacts to this hubbub, instead merely returning to eating their food. Lynch rolls the end credits, similarly without any reaction on the part of his camera, or the show’s narration. The refusal of the characters to engage with a fellow human in distress might merely point to the fact that this very different town of Twin Peaks from the 1990s one we fondly remember is also caught in the time loop. 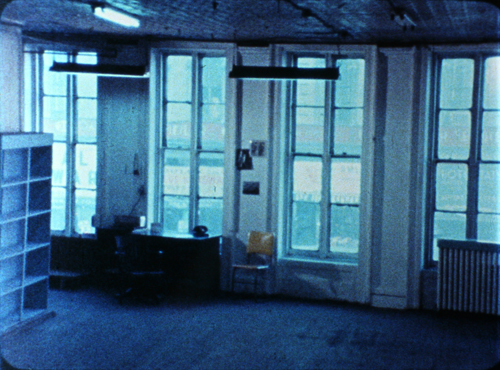 However, the scene also recalls Michael Snow’s structural film, Wavelength (1967), a forty-five-minute long take of a zoom across the living room of an apartment. Halfway through, a man arrives and dies, collapsing in front of the camera. Snow refuses to react to this startling development, not even tilting the camera downward, instead stubbornly continuing the zoom into a photograph on the wall of an ocean wave. Wavelength replaces Warhol’s cinema of boredom with the isolation of a particular cinematic practice, in this case, the zoom, choosing aesthetics over narrative. In trapping the ending sequence of episode seven of Twin Peaks: The Return between Warhol and Snow, Pop Art and Structural Cinema, David Lynch re-purposes experimental cinema for the creation of one of the most thought-provoking summers in the history of American television, and we are still a dozen hours from the end.